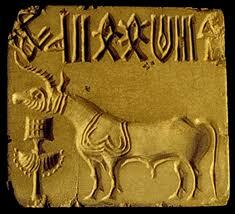 1.The Indus valley civilization is one of the most mysterious civilization because the scripts are not revealed yet. 2.The Indus Civilization is also known as the Harappan Civilization because Harappa was one of the first cities excavated from the Indus site. 3.The Indus Valley Civilization is one of the first urban civilization along with the Egyptian and Mesopotamian civilization. 4. At it's most important stage the Indus valley Civilization's population was over 5 million. 6.Toy were seen at the excavation site indicating that the children of Indus civilization played a lot. 7. There were no weapons seen at the excavation site that means that the Indus Valley Civilization had no war or conflict. 8.They had a structure known as the Great bath which was a public bath to save water. 9. The Civilization was spread over 1,260,000 km² making it the largest civilization. 10. Various sculptures, pots and gold jewelry were found at excavation sites. The main occupations of this civilization were farming meaning they had to take care of animals and the other one was a mender meaning they stitched clothes. The evidence was they found many clothes and dead bodies of animals at the excavation site. From this the archaeologists predicted that the main occupation of the people were Farming and mending. The people of the Indus valley civilization believed in many gods and goddesses. The main religion was Hinduism. The development of the writing started 4000 BC. After that around 1000 years later the Indus people shaped their culture. Then they developed their culture more and they learned many ways to bury their dead.